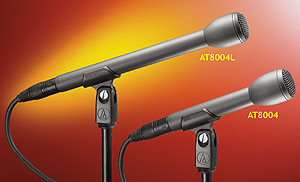 The AT8004L and AT8004 are two excellent dynamic omnidirectional reporter (news-gathering) mics from Audio-Technica. Both are designed for interviews and have a rugged housing with hardened-steel grille which stands up to hard field use. Its internal shock mounting minimizes handling and cable noise. The only difference between the two models is that the AT8004L has a long handle for getting that bit closer in the scrum of hard news gathering and sports interviews, and the AT8004 has a normal length short handle for more compact storage when travelling. 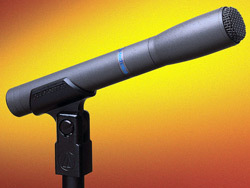 Supplied Accessories: AT8405a Stand Clamp; soft case. The AT8010 is one of three excellent omnidirectional reporter (news-gathering) mics from Audio-Technica. This one is the more sensitive of the bunch because it is a condenser. It is therefore also good for round table discussions and similar applications. It has an extremely smooth, extended response on and off axis, low sensitivity to p-popping and overload, and operates on either a single internal battery or external phantom power. Supplied Accessories: AT8405a Stand Clamp; AT8136 foam windscreen; battery; soft case. The AT8031 is just perfect for report interviews in noisier environments as well as narration and general features-style presentation. For voice-over it sounds open and natural, even providing added warmth when used close up. Great for narration, its sound is similar to far more expensive studio microphones. Its cardioid polar pattern reduces pickup of sounds from the sides and rear, improving isolation of the desired sound source. Supplied Accessories: AT8405a Stand Clamp; AT8114 foam windscreen; battery; soft protective pouch. 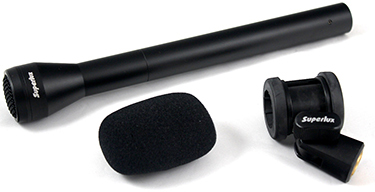 The PRA-318L is an affordable everyday dynamic omnidirectional microphone that will provide good quality audio for the broadcast or oral history reporter on a budget.